Vermont Independent Senator Bernie Sanders sent a fiery letter to Center for American Progress, a liberal think tank long associated with establishment Democrats, accusing the group of smearing progressive 2020 presidential candidates, including Elizabeth Warren and Cory Booker. Sanders sent a personally signed letter Saturday to the board of the Center for American Progress and CAP Action Fund, tying the group to right-wing political attacks on his personal finances and fight against income inequality. "I and other Democratic candidates are running campaigns based on principles and ideas and not engaging in mudslinging or personal attacks on each other," Sanders wrote in the April 13 letter first obtained by The New York Times Sunday. "Meanwhile, the Center for American Progress is using its resources to smear Senator Booker, Senator Warren, and myself, among others. This is hard the way to build unity, or to win the general election." The CAP nonprofit was started in 2003 by John Podesta, former chief of staff to President Bill Clinton. Podesta would later become chairman of Hillary Clinton's unsuccessful 2016 presidential campaign. In that capactiy, Podesta was instrumental in squashing Sanders' 2016 primary challenge against Clinton. Despite these allegations against CAP, numerous polls and totals from initial fundraising efforts show Sanders as a frontrunner in the crowded 2020 Democratic presidential candidate field. In the letter, Sanders pushed back against accusations of "hypocrisy," instead saying the group's leader Neera Tanden "repeatedly calls for unity while simultaenously maligning my staff and supporters and belitting progressive ideas." Sanders, writing in the April 13 letter, criticized the powerful Democratic Party establishment group for mocking his appearance and personal income in a piece published on ThinkProgress, which operates under the CAP umbrella. Sanders' letter appears to illustrate the deep divide between liberals and farther-left liberals within the Democratic party. A video produced last week by ThinkProgress entitled, "Bernie's Millionaire Problem," criticized Sanders by attempting to paint him as a hypocrite for asking wealthy Americans to pay their "fair share" in taxes. 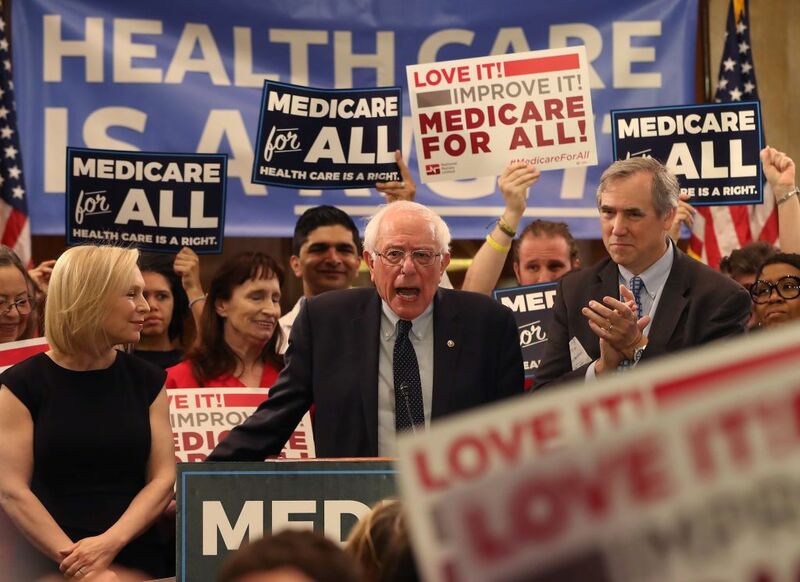 Jodi Enda, editor of ThinkProgress, later defended the piece in a statement to the Daily Beast, saying, "The video illustrated how Sen. Sanders’ rhetoric has evolved." Earlier this month, former President Barack Obama told attendees of a Berlin, Germany event he was concerned about what he viewed as inflexible progressives forming a "circular firing squad" among left-leaning voters and pundits. “One of the things I do worry about sometimes among progressives in the United States—maybe it’s true here as well—is a certain kind of rigidity where we say, ‘Oh, I’m sorry, this is how it’s going to be. And then we start sometimes creating what’s called a 'circular firing squad' where you start shooting at your allies because one of them is straying from purity on the issues." Sanders recently joked about the criticism he's received over his personal wealth from book sales, telling a Gary, Indiana crowd, "I didn't know it was a crime to write a good book." "I wrote a best-selling book. If you write a best-selling book, you can be a millionaire, too," Sanders, author of the 2016 bestseller, Our Revolution, as well as 2018's Where We Go from Here: Two Years in the Resistance, added to The New York Times last week.